When I was about sixteen and headed off to a high school dance with a date … which means it was probably a prom … my Dad stopped me and told me I should shave before I went. In a town that was largely Italian, I may have been two or three years past the usual first-shave age, but I was thrilled none-the-less. Every boy wants to be a man until they’ve tried it for 20 or 30 years, at which point he realizes how much fun being a boy was. My first shave was with my Dad’s electric razor. As my beard thickened, I got my own Gillette double-edged safety razor, just like Dad’s. You may not know that King Camp Gillette was the inventor of the disposable double-edged blade and was the supplier of safety razors to American troops during World War I. Because GIs were allowed to keep their razors when the war was over, Gillette had a guaranteed customer base for his blades, making Gillette the dominant force in shaving supplies. Me? I stopped at three blades, settling on the Gillette Mach 3 for many years. 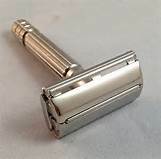 Razor manufacturers continued to introduce new innovations such as additional lubricating strips and razor handles that allowed the razor cartridge to tilt or swivel to follow the contours of a face. And the prices of the blades began to climb … manufacturers were practically giving away razors in order to get people to use their latest blades. Last week, after seeing a package of Mach 3 Fusion blades priced at over $50 in Costco, I decided to fight back. Searching on Amazon, I found that the old-fashioned double edged shavers are making a comeback. There are numerous manufacturers producing everything from the basic device that I used as a teenager to designer models costing over one hundred and fifty bucks. And there are dozens of blade manufacturers, too, from all over the world. The Amazon comments section is packed with advice from wet shave enthusiasts regarding what to buy and why. I found I could buy an assortment of blades so that I could try different brands and settle on the ones I like best. 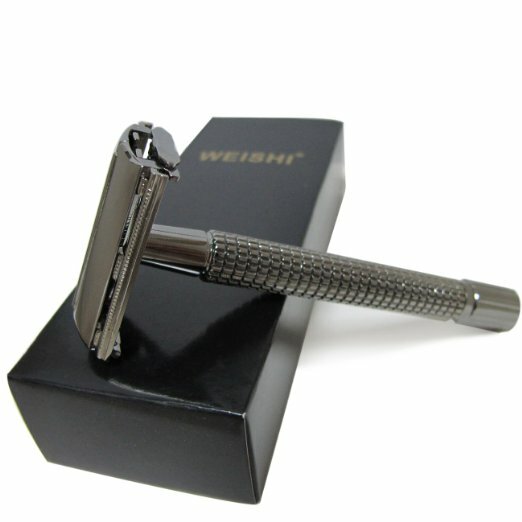 I bought a WEISHI Long Handle Version Butterfly Open Double Edge Safety Razor that came with five YingJili blades from Japan for about sixteen bucks. I also bought 20 Feather brand blades for about seven bucks. So, I got a razor and 25 blades for lest than the cost of 24 Mach 3 cartridges at Costco. I’ve been shaving with it for about a week now. For the first few shaves, the weight of the razor and the sharpness of the blade against my face made me cautious … with the result that the shave wasn’t as close as I was used to. But after a week, I’ve found the right angle at which to hold the razor and I’m no longer afraid to apply the necessary pressure to give me a smooth shave. The single blade (on each side of the razor) is actually better for trimming along the edges of my beard than the three-blade contraptions. The razor feels particularly manly in my hand (Thanks, Dad). I’m a happy customer … and think of the money I’m saving. Maybe I’ll buy a new car 🙂 . This entry was posted on January 25, 2017 at 12:56 pm and is filed under feeling older, health. You can subscribe via RSS 2.0 feed to this post's comments. Great post, Older Eyes! I’ve had a beard (short, well trimmed) for nigh on 40 years and just shave around its perimeter with an electric razor. However, sometimes in a fit of nostalgia, I fantasize about grabbing a heavy-handled single edged razor, lathering up, and shaving the old fashioned way. However, memories of razor burn and hamburger face make me stand down. The curses of sensitive skin! It’s why I grew a beard in the first place. I remember those old heavy razors – you had to pay attention, but they worked. Prices of the new ones are nuts – the marketing companies have found that the”new and improved” and “more is better” advertisements work well. Time to revise an old phrase “fool and his money are easily parted”? The razor business has become such a racket, for both men and women. My daughter just bought a men’s razor because the women’s varieties tend to be more expensive, simply because … they’re prettier, I guess? Maybe we need to do some of our own research on Amazon and stop buying whatever’s available at Target. Good to hear from you. Life’s been a load … some good some not so … but I’m trying to get back to writing. How about you? Will stop by to ser.